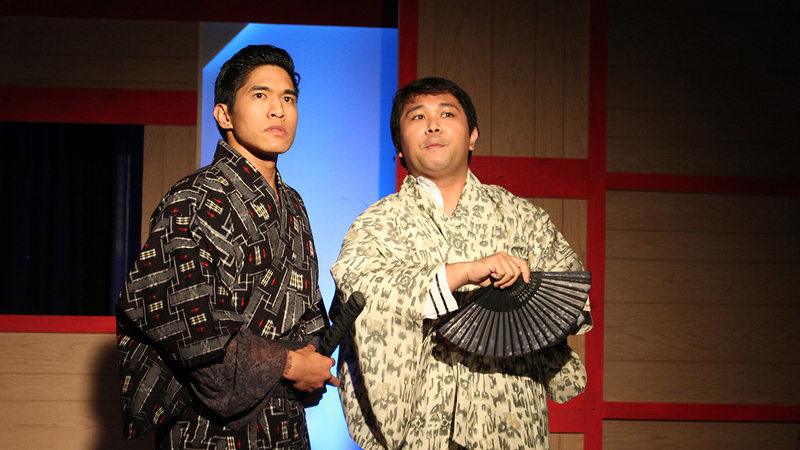 Cesar Cipriano is Kayama in Chromolume's production of Sondheim's Pacific Overtures. LIn the early 1970s, Stephen Sondheim made musical history, winning the Tony Award® for Best Original Score in three consecutive years: Company in 1971, Follies in 1972, and A Little Night's Music in 1973. Before launching another run of Best Score Tonys with Sweeney Todd in 1979, he wrote a history musical. But there was a twist: Pacific Overtures not only raised questions about one historical event, it reminded that all history is at best subject to human fallibility and at worst to outright falsehood. 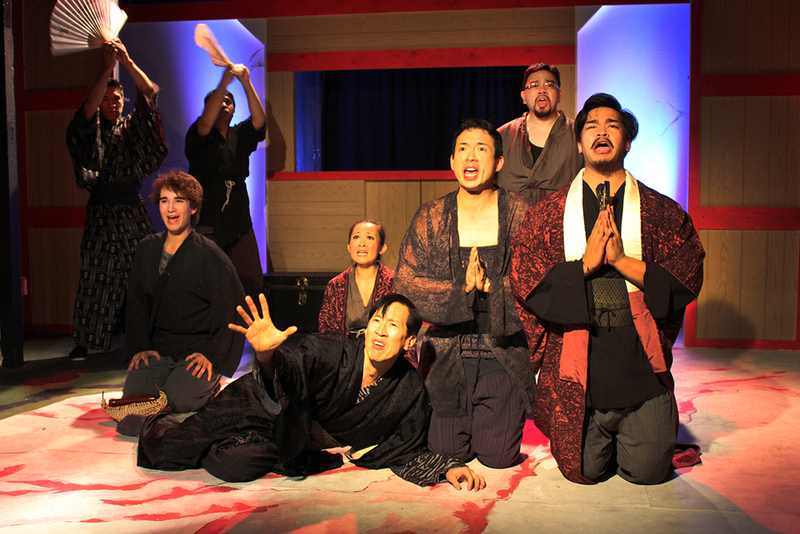 Chromolume Theatre is reviving Pacific Overtures at The Attic through December 17. [Note, additional performances were added on December 22 and 23. TICKETS] The production is directed by James Esposito with musical direction by Daniel Yokomizo and choreography by Michael Marchak. History has been kind to Sondheim's music and lyrics, John Weidman's book, and the additional material provided by Hugh Wheeler. Today it resonates with greater currency than when it premiered four decades ago, the fourth of six consecutive collaborations with director Hal Prince. Pacific Overtures' historical context – American trade negotiations with Asia – and its dramatic subtext – the reliability of official declarations – are more topical than ever in this era of political surrealism. Only a few weeks before this production opened, trade ministers from Japan and ten other Pacific Rim countries began redrafting the Trans-Pacific Partnership agreement after a twelfth partner, the United States, withdrew to pursue trade deals with individual countries that would "put America first." Even in the current flush of inaccurate statements from our Hyperbolist in Chief, this seemed historically short-sighted. 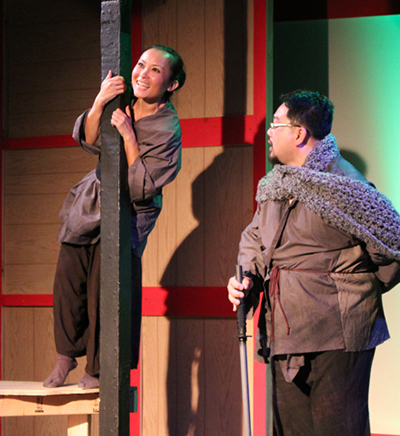 Pacific Overtures is about how America was first to trade with Japan. The musical's American authors sought to depict, from a Japanese perspective, the gunboat diplomacy that won the U.S. Japan's first trade agreement with the West. To do this, Sondheim used pentatonic scales and Asian instruments in the music and haikus in the lyrics for a quasi-Japanese sound, and collaborated with director Prince and their designers on incorporating the costumes, make-up, and movements of Japanese kabuki theater. In 1853, 250 years after Japan forced out all foreigners and enacted laws to stay commerce, investment or even visits from them, a U.S. naval envoy under the command of Commodore Matthew Perry arrived with a letter from President Millard Fillmore requesting that the Emperor end or at least consider suspending for five or ten years, those ancient laws. Despite its diplomatic niceties the letter bore a commanding tone: "We are very much in earnest in this," and "We are very desirous of this," and "I have sent … a powerful squadron." The story, which extends from the initial arrival in 1853 to decades later and then adds a contemporary epilogue, introduces two characters with crisscrossing narrative arcs. Kayama, a minor samurai, is elevated in rank and then pressed into official service as a go-between with the Americans. His strategy of embracing the West to help negotiations will eventually overtake him. "I move up from minor samurai to Prefect of Police and then Governor because of the Westerners," explained Cesar Cipriano, who plays Kayama. "Then during the song 'Bowler Hat' you see me change from a timid guy to sort of a leader. By the time I'm old I've done things that are not heard of there: lost my wife and married someone else, then left her. I drink a lot and seem to follow the trappings that, on one hand, you might use to advertise how wonderful America is, but then I get caught up in it, leave my wife and essentially became a drunk." The character whose complementary arc moves him in the opposite direction is Manjirō, (Daryl L. Padilla), a fisherman who has lived in the U.S. since he was rescued by Americans at sea. As he observes the American tactics, he begins to shed all his adopted Western trappings and by the end has fiercely re-embraced his native traditions. "Although Kayama isn’t a historical figure, Manjirō Nakahama is," said Cipriano. "Manjirō was the first Japanese person to live in America and when he returned to Japan, he was treated harshly until they found him to be an asset." 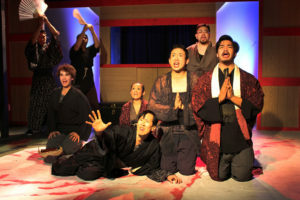 This is Cipriano's second appearance on Theatertimes, following his 2008 performance as "The Ghost of Bruce Lee" in East West Players' world premiere of Be Like Water by Dan Kwong. It was "one of the most wonderful characterizations seen this year," according to our review. Cipriano turned "what could be a poster-thick movie star portrait into a tribute to the actor and all the Asian American teens who saw in him a powerful, uplifting on screen reflection." That sensitivity will be invaluable in helping director Esposito achieve what Cipriano believes is Sondheim's goal. "He is trying to provide an historical point of view, but from a perspective that no one knows about," said Cipriano, who previously appeared in Sweeney Todd and West Side Story. "The Japanese version of events was not recorded. So we don't know what they went through and Sondheim's trying to present what it might have been. He researched what we do know of the culture and then asks if we believe they would have accepted it based on the American account that became history." What becomes history is the musical question asked in the song "Someone in a Tree," which ends Act I of Pacific Overtures. Set decades after the Americans and Japanese sign their first trade agreement, "The Reciter," the play's narrator played here by Paul Wong, is offered an eyewitness account by an old man (Marcel Licera) who was in a tree overlooking the compound of the treaty house. No sooner has the old man apologized for the faintness of his aged memory than the 10-year-old he was (Julia May Wong) arrives to climb up to his perch. Suddenly we are simultaneously in the parallel realms of the occurrence being experienced – by one too young to understand it – and remembered by one too old to confidently recollect it. A second witness, who only heard scraps of conversation while hiding beneath the treaty house, appears to add his incomplete real-time description. The song is now a quartet. As Sondheim explained to an unrecognizable Frank Rich in a 1976 video called "Anatomy of a Song" (links in sidebar), the music's structure and rhythm is meant to create "a relentlessness that stretches out the time and gets into what I think is the musical equivalent of the philosophical idea of the song, which is history. The song's about history and the show's about history. "It is my favorite song … of anything I've ever written," he added. This was, it must be noted, before Sweeney and the Pulitzer Prize-winning Sunday in the Park with George. Nevertheless, it is a landmark. "Yeah," Cipriano agreed. Then he brought it back around to America's account of the 1853 trade negotiations, which they had certainly embellished to save face. "It's hard to say what really happened, especially at the treaty house. The whole 'Boy in a Tree' section shows there were witnesses, but they're not giving details because what's recorded in history is only recorded from the Western point of view." The cast also features Marcel Licera as Lord Abe and Old Man, Peter Jeensalute as Mother and an American Admiral, Daniel Koh as the Madam and a British Admiral, John Sala as a warrior the Russian Admiral), Julia May Wong as the Young Boy and Tamate, Gibran Mahmud as a Fisherman and the Dutch Admiral, and Kevin Matsumoto as Perry and the French Admiral. Reuben Uy is understudying Koh. Photos: Top – Cesar Cipriano and Daryl Leonardo in Chromulume Theater's production of Stephen Sondheim's Pacific Overtures ; first inset – cast members perform "Four Black Dragons," a song about the arrival of Commodore Perry's ships; second inset - Julia May Wong and Marcel Licero perform "Someone in a Tree."